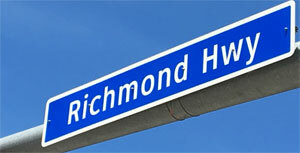 Richmond Highway Widening Project continues to move along with completion of the Environment Assessment. VDOT released the Environmental Assessment (EA) and held a public hearing last night to review the findings with the community. More than 100 people attended the public hearing at Mount Vernon High School among which were several Chamber members, other business owners, and elected officials. The new VDOT engineer responsible for the project is Dan Reinhard, P.E. (dan.reinhard@vdot.virginia.gov) and he conducted the meeting. Anissa Brown (Anissa.Brown@vdot.virginia.gov) conducted the Environmental Assessment and explained the findings during the hearing. Other commercial properties would be impacted by temporary right-of-way required for construction. This would be places for VDOT to stage equipment and materials needed for construction. Temporary right-of-way would be short-term, for the duration of the construction work, and returned to the previous land use upon completion of the project. While the road design is not final, the interactive map gives a good idea of which businesses will be impacted by the widening. Now is the time to contact VDOT and your Supervisors to voice your concerns before the final design is released in January / February of 2019. One of the design features VDOT talked about last night were pedestrian underpasses or sidewalks that go underneath Richmond Highway. These proposed underpasses would be placed where the highway crosses Dogue Creek and Little Hunting Creek. VDOT is seeking public comment on this idea. Representatives from VDOT will attend the Chamber’s February Business Breakfast and show the final design for the highway.